The other day my friend Kip asked me for some green bean recipes. We were praising pole green beans and their rich flavor and texture, so superior to the milder flavored bush green beans. They are steadily abundant now, a meal’s worth or more of Fortex, Gold of Bacau, Nor’easter, and Rattlesnake ripening each day on the vines climbing in my kitchen garden. To feature this great flavor, I often simply boil each variety individually until tender, three to five minutes depending on variety, in a large, uncovered kettle of salted, boiling water, drain them, put them in a bowl or on a platter and serve them. I remember a guest asking me once if I had added sugar. They are that sweet when they’ve come fresh from the garden, go into the kettle and then right to the table. But while green beans are wonderful on their own, they also blend well with other flavors. One combination I look forward each late summer is green beans, tomatoes, garlic and basil. The first recipe that introduced me this quartet was Marcella Hazan’s “Fagiolini con Pomodoro, Aglio e Basilico” in her Marcella’s Italian Kitchen (1986). Such fun to repeat in Italian! As a side dish, warm or at room temperature, it’s a perfect blend of sweet bean and spicy/acid tomato flavors with the deeper undertones of basil and garlic. And as a sauce over thick pasta like penne, with a handful of freshly grated Parmesan, it makes a meal to celebrate late summer. The proportions Hazan recommends are one pound of ripe fresh tomatoes, a pound-and-a-half of green beans, a half-cup olive, two teaspoons of chopped garlic, salt, pepper and one cup of fresh basil leaves. For pasta sauce, increase the tomatoes to a pound-and-a-half and the garlic to three teaspoons. In a skillet large enough to hold everything, sauté the garlic in the olive oil until it’s golden, add the peeled, roughly chopped tomatoes, and cook at high heat for about five minutes. Reduce the heat to medium, add salt and pepper to taste and the beans, whole or sliced and cook until the beans are tender. If, when the beans are done, there’s still some watery tomato juice in the skillet, remove the beans and turn up the heat to reduce the extra liquid. 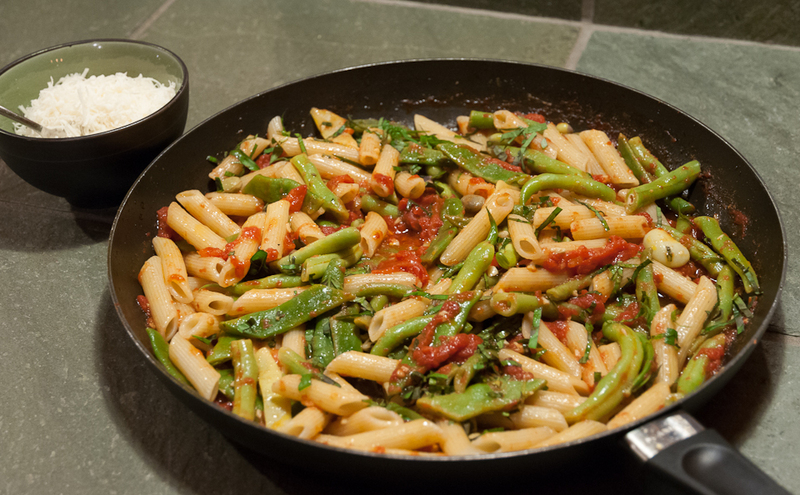 When the sauce has reduced, return the beans to the skillet, add the basil and serve either as a side dish or on pasta. Another version of this bean and tomato combination that I’m eager to try is Melissa Clark’s Brown Butter, Tomatoes and Green Beans. http://www.melissaclark.net/blog/2012/09/my-entry.html She’s very persuasive about the flavor benefits of browned butter. Who knows, it may replace olive oil in this combination! 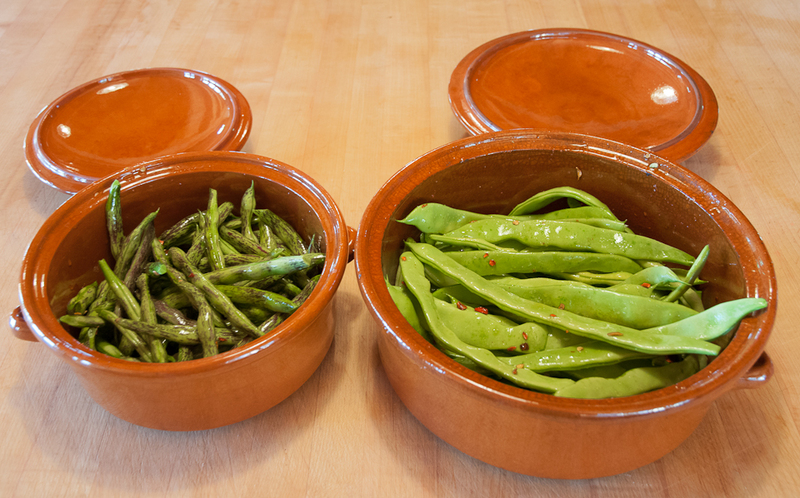 And finally, one more delicious flavor/texture addition to the green bean/tomato combination is fresh shell beans. They are plump in the pods and ready to harvest now and pair beautifully with their green bean cousins. 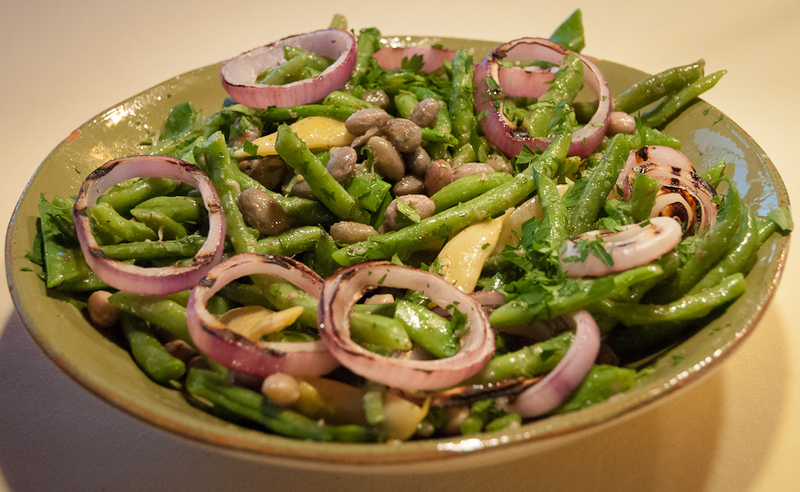 The mustard vinaigrette is perfect with the beans, the charred red onions are sweet and crunchy, and the combination of green beans and shell beans is a flavor and texture treat. A couple of times, when I’ve had a lot of green and yellow beans, I’ve left out the shell beans and the salad is still delicious. I’ve also used chive blossoms instead of charred red onion for a sharp oniony flavor and the pretty purple of the blossoms. I haven’t used fava beans yet but I will soon. I have this year’s crop of favas already in the freezer but I’ll thaw some out for this delicious salad. At the other extreme from green bean salad are “Long-Cooked Romano Beans,” a truly wonderful recipe from Judy Roger’s Zuni Café Cookbook (2002) and the best way I know to use beans that have matured beyond salad size. 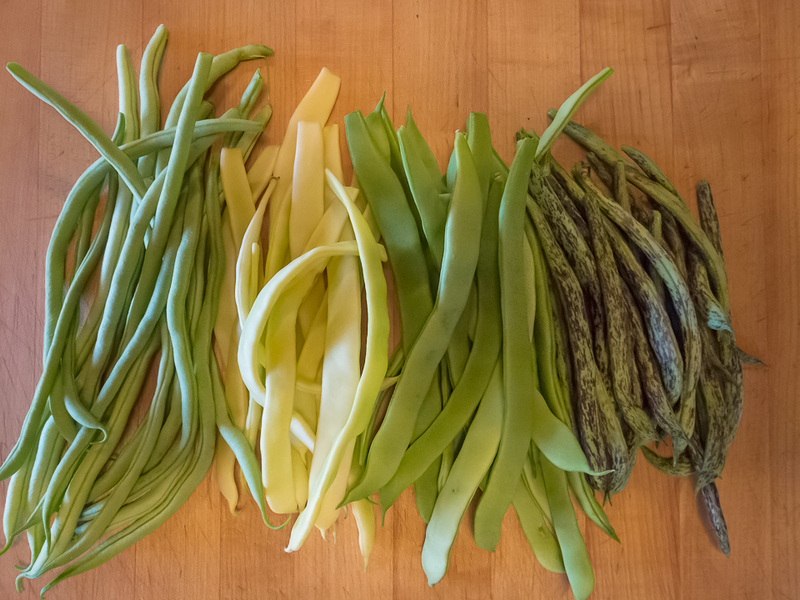 As Rogers writes in the introduction to the recipe, “They are hours from bright green and al dente, but, perfectly prepared, they have a velvety texture and long flavor that are very satisfying.” I’m always happy to find enough mature beans on the vines to make this dish. For four servings, she recommends two pounds of Romano beans (Fortex and Rattlesnake work well too but not the softer yellow beans like Gold of Bacau), about a quarter cup of olive mild olive oil, salt, a few pinches of chili flakes and two to four crushed garlic cloves. Break or snip the stem ends off the beans. Unless they are badly shriveled, I leave the tail ends intact. Place in a 6-quart Dutch oven or crowd into a 4-quart saucepan. Drizzle and fold with olive oil to coat all the beans generously, sprinkling with salt and chili flakes as you go. I use my hands to do this. Drop the garlic cloves on top, cover, and place over very low heat. You should barely hear a faint sizzle. Stir a few times during the first 30 minutes, to make sure the beans on the bottom don’t scorch, covering the pot again quickly each time so the little steam the beans produce doesn’t evaporate (don’t add water—the flavor and texture will suffer if you do). Once the beans begin to soften, usually after about 45 minutes, stir again. Taste for salt. Once they have started to soften, you should notice the oil pooling shallowly on the bottom of the pot. Now check on the beans every 30 minutes or so, but stir only once more, and gently, to avoid crushing the beans. Cook until the beans are utterly tender and limp and have a rich, concentrated flavor, usually about 2 hours total cooking time (smaller beans may take less time than fleshy romanos). Waiting for this degree of doneness will require a leap of faith for anyone trained to favor al dente vegetables. The beans at the bottom of the pot may color a little during the last 30 minutes before the whole pot is ready, but they will still be delicious. Preparing these beans does take patience and a leap of faith, but everyone who’s tasted them agrees that they are amazingly delicious. One friend calls them bean pasta because they have the texture and softness of pappardelle. I cook them in a terra cotta casserole from the Spanish Table. It can go on a gas flame and works really well for this technique. When we get to the end of the beans each summer, I’m always sorry I didn’t plant more. They are not as flashy as those other summer vegetables, tomatoes, peppers and eggplant, but they are the seasonal vegetable I miss the most when they are gone. 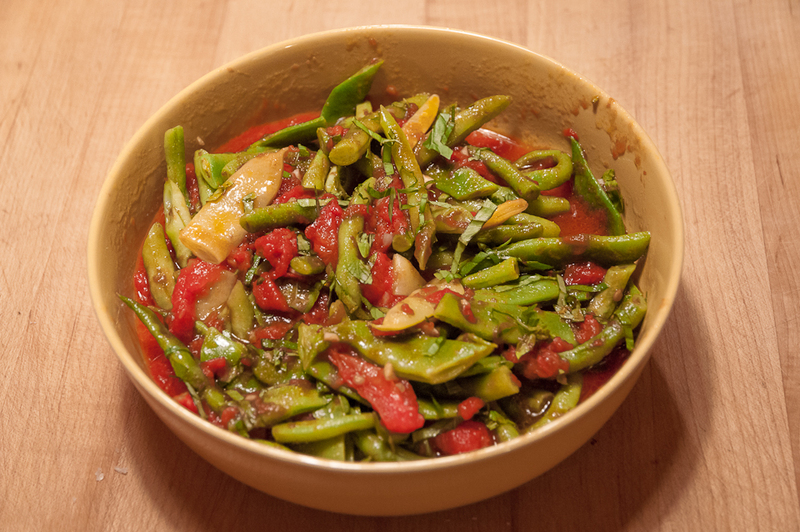 This entry was posted in Summer Vegetables and tagged David Tanis green bean salad, Green bean recipes, Long-cooked Romano beans, Marcella Hazan's beans tomatoes basil garlic, Pole Green Bean Recipes by Lopez Island Kitchen Gardens. Bookmark the permalink. Debby – reading this made me incredibly hungry. I do love my beans. And thanks for mentioning the type of dutch oven you use. I was admiring it and all your serving dishes/plates too. Lovely. 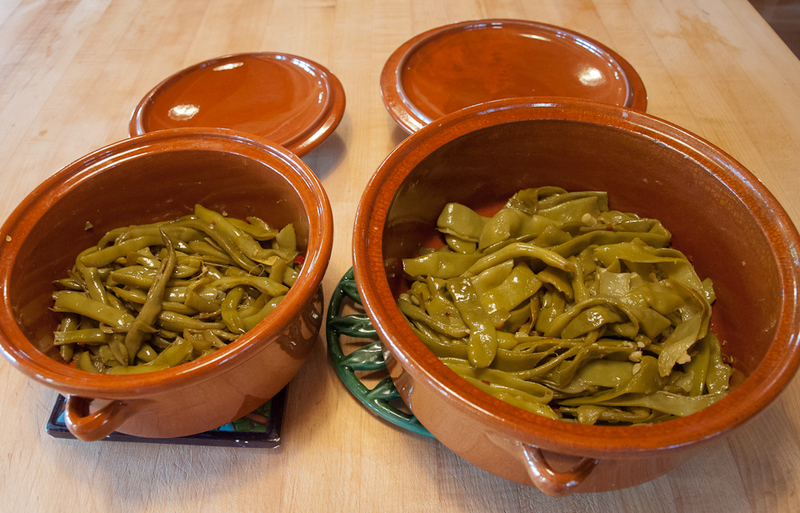 Question for you – do you know of a good way to freeze fresh beans? In the past I have blanched then frozen them – but they are soggy when thawed. Ewww. Alas, I don’t have any recommendations on freezing green beans. The few times I tried, using the blanch, chill, freeze method, they simply didn’t taste good enough later to be worth the bother. I’ve pretty much resigned myself to eating them nearly every day when they are in season, no hardship though it’s sad when they’re gone. I usually don’t like eating frozen beans, but last year, I froze several packages. I find that they are best cooked 2 minutes in a pressure cooker. I got an electric one for Christmas and 2 min, is enough for them to “plump again” and they taste almost like fresh cooked beans. Thank you for all these recipes! I must say, I felt like a VIP when you called me by name… 🙂 I can’t wait to plant more different kinds of pole beans next year.